London’s Hackney Council has been accused of “criminalizing homelessness” after announcing a system of fines intended to tackle anti-social behavior, including rough sleeping and begging. 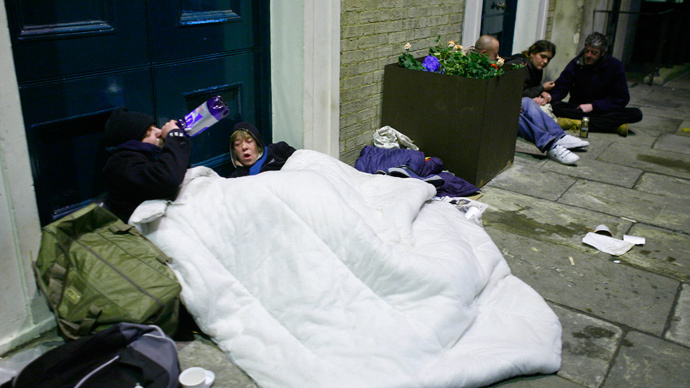 Government figures show 6,508 people slept rough in London last year. Homeless people found begging in the streets of Hackney could be issued a £100 on-the-spot fine with a potential court charge of £1,000 under the new Public Space Protection Order (PSPO). The council says the Protection Order is being put in place to tackle persistent “anti-social behavior” such as begging, rough sleeping in “hot spots” and street drinking. However it is still unclear how the council will collect the money from rough sleepers. Several organizations have spoken out and launched a petition against the council’s order. Commenting on the order, Heather Kennedy from campaign group Digs said the council’s “criminalization” of homeless people has angered Hackney residents. “[A] large number of people” are planning to protest against the PSPO, she told the Hackney Times. The council “failed to support residents in housing need … in the middle of a housing crisis,” she said. “We will not rest until the criminalization of homelessness in our borough is overturned,” she added. Hackney Community Law Centre also released a statement pleading with the council to consider amending the order. Hackney Deputy Mayor Sophie Linden insists the order was put forward so the borough could see a reduction in anti-social behavior that affects the safety and wellbeing of residents. “Enforcement will always be a last resort and only used for those who continue to sleep rough,” she told the Hackney Times. Commenting on the nature of the order, Homeless Link Director of Policy and Communications Jacqui McCluskey told RT she “doesn’t think it’s right” to criminalize homelessness. The measures brought forward by the Hackney Council “do nothing to tackle the causes of homelessness and rough sleeping,” she added. Condemning the order, Jon Sparkes, chief executive of homelessness charity Crisis, said plans to ban and criminalize rough sleeping will be “counter-productive” and only make it harder to access the support people need to get off the streets for good. However, Thames Reach Communications Manager Mike Nicholas argues the PSPO in Hackney is being used to specifically tackle begging, which he linked to heroin, street drinking and crack cocaine use rather than homelessness.